There are 290 firm orders by 14 customers for the passenger version of the Airbus A380-800, of which 235 have been delivered as of March 2019[update]. There were originally also 27 orders for the freighter version, the A380F, but when this programme was frozen following production delays, 20 A380F orders were cancelled and the remaining 7 were converted to A380-800s. Data through 31 March 2019. ^ a b c d e Orders & Deliveries summary. Airbus, 28 February 2019. ^ "Air France, the first European carrier to offer flights on the A380". Air France. Archived from the original on 8 November 2011. Retrieved 9 April 2011. ^ "Air France, canceled remaining A380 orders". 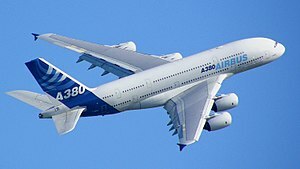 ^ "ANA Group selects the A380". Airbus.com. 29 January 2016. Retrieved 20 February 2016. ^ "Asiana orders six A380s". Flightglobal. Retrieved 14 December 2013. ^ Airbus [@Airbus] (26 May 2014). ""With today's delivery, @AsianaAirlines becomes the 11th airline to join the "#A380 club"." F. Brégier" (Tweet) – via Twitter. ^ "Original Livery In As 757s Bow Out" (Press release). British Airways. 5 October 2010. Retrieved 9 April 2011. ^ "China Southern Airlines' first A380 makes its maiden flight" (Press release). China Southern Airlines. 16 February 2011. Retrieved 9 April 2011. ^ "Emirates A380". Emirates. Retrieved 4 April 2011. ^ "Rolls-Royce receives record £6bn engine order". BBC News. 17 April 2015. ^ Osborne, Tony (17 April 2015). "Emirates Orders Trent 900 For Future A380s". Aviation Week & Space Technology. Archived from the original on 17 April 2015. Retrieved 17 April 2015. ^ "Our history". Etihad Airways. Archived from the original on 24 February 2011. Retrieved 9 April 2011. ^ "Korean Air A380". Korean Air. Archived from the original on 23 September 2011. Retrieved 27 August 2011. ^ a b "Lufthansa Annual Report 2011" (PDF). Lufthansa. Archived from the original (PDF) on 17 April 2012. Retrieved 2 April 2012. ^ "Malaysia Airlines Posts RM226 million Net Profit, Operating Profit Up At RM137 Million For 4Q10" (Press release). Malaysia Airlines. 25 February 2011. Archived from the original on 20 August 2011. Retrieved 10 April 2011. ^ "Airbus Hit By Jet Cancellations". ^ a b c Max Kingsley-Jones (24 May 2011). "Qatar Airways plots Paris A380 and A330P2F deals". FlightGlobal. Archived from the original on 27 May 2011. Retrieved 28 May 2011. ^ "Singapore Airlines A380". Singapore Airlines. Retrieved 27 August 2011. ^ "THAI's A380". Thai Airways. Archived from the original on 9 March 2012. Retrieved 27 August 2011. ^ a b c d e f g h i "A380 WOW!!!". Airbus. Archived from the original on 25 January 2018. Retrieved 26 May 2014. ^ "Konnichiwa! All Nippon Airways receives its initial A380". Airbus. Retrieved 29 March 2019. ^ "Asiana Airlines' first A380 delivery". 26 May 2014. Archived from the original on 27 May 2014. Retrieved 26 May 2014. ^ "British Airways takes delivery of its first of 12 Airbus A380s". 4 July 2013. Retrieved 26 May 2014. ^ "Etihad Airways receives first Airbus A380". Airbus. 18 December 2014. Archived from the original on 23 January 2015. Retrieved 14 January 2015. ^ "Qatar Airways takes delivery of its first Airbus A380". Reuters. 17 September 2014. Retrieved 18 September 2014. ^ a b "Emirates Triples A380 Order, Selects A340-600 and Adds A330s" (Press release). EADS. 4 November 2001. Retrieved 28 March 2011. ^ "Emirates becomes first to sign for A3XX" (Press release). EADS. 24 July 2000. Retrieved 28 March 2011. ^ "Emirates commits to the A3XX" (Press release). Airbus. 30 April 2000. Archived from the original on 27 September 2011. Retrieved 7 April 2011. ^ "Air France places major order" (Press release). Airbus. 18 June 2001. Archived from the original on 27 September 2011. Retrieved 7 April 2011. ^ "Air France confirms A3XX pre-selection" (Press release). EADS. 24 July 2000. Retrieved 28 March 2011. ^ Kaminski-Morrow, David (2 March 2010). "ILFC A380 deliveries pushed back by one year". Flightglobal.com. Reed Business Information. Retrieved 3 April 2011. ^ "ILFC Picks GP7000 for A380s" (Press release). GE Aviation. 4 September 2003. Retrieved 28 March 2011. ^ "Landmark A380 contract signed" (Press release). Airbus. 19 June 2001. Archived from the original on 27 September 2011. Retrieved 7 April 2011. ^ "ILFC signs for five A3XXs" (Press release). Airbus. 25 July 2000. Archived from the original on 27 September 2011. Retrieved 7 April 2011. ^ "Singapore Airlines to be world's first A380 operator" (Press release). Airbus. 16 July 2001. Archived from the original on 27 September 2011. Retrieved 8 April 2011. ^ "Singapore Airlines to order up to 25 A3XXs" (Press release). Airbus. 29 September 2000. Archived from the original on 27 September 2011. Retrieved 8 April 2011. ^ Ostrower, Jon (18 September 2008). "First A380 for Qantas - The road to delivery". Flightglobal.com. Reed Business Information. Retrieved 12 April 2011. ^ "Qantas becomes Launch Customer for the A3XX while also Ordering A330s" (Press release). EADS. 29 November 2000. Retrieved 28 March 2011. ^ "Virgin Atlantic confirms order for six A380s" (Press release). EADS. 26 April 2001. Retrieved 28 March 2011. ^ "Virgin Atlantic becomes A3XX Launch Customer" (Press release). EADS. 15 December 2000. Retrieved 28 March 2011. ^ "Form 10-Q: Quarterly Report, FedEx Corporation" (PDF). 31 August 2002. Retrieved 11 April 2011. ^ "FedEx signs for 10 A380s" (Press release). Airbus. 16 July 2002. Archived from the original on 27 September 2011. Retrieved 8 April 2011. ^ "FedEx Express to acquire Airbus A380-800F" (Press release). EADS. 17 January 2001. Retrieved 28 March 2011. ^ "Qatar Airways confirms orders for A380s" (Press release). Airbus. 9 December 2003. Archived from the original on 27 September 2011. Retrieved 8 April 2011. ^ "Qatar Airways selects the A330 and contributes to the launch of the A380" (Press release). EADS. 27 February 2001. Retrieved 3 April 2011. ^ "Lufthansa and Airbus partner on inaugural A380 route-proving flight to U.S." (PDF) (Press release). Lufthansa. 19 March 2007. Retrieved 8 April 2011. ^ "Lufthansa Signs for 15 A380s Taking Airbus Orderbook to Nearly 100 Superjumbos" (Press release). EADS. 20 December 2001. Retrieved 28 March 2011. ^ Yeo, Ghim-Lay (16 August 2010). "MAS expects first A380 in April 2012 after several delays". Flightglobal.com. Reed Business Information. Retrieved 3 April 2011. ^ "Emirates orders 41 additional Airbus aircraft" (Press release). Airbus. 16 June 2003. Archived from the original on 19 July 2012. Retrieved 3 April 2011. ^ "Korean Air looks to the future with A380" (Press release). Airbus. 23 October 2003. Retrieved 7 January 2011. ^ "Korean Air goes for Airbus A380" (Press release). Airbus. 18 June 2003. Archived from the original on 23 July 2012. Retrieved 4 April 2011. ^ Waldron, Greg (4 August 2009). "Thai confirms A380 delivery delayed until 2012". Flightglobal.com. Reed Business Information. Retrieved 3 April 2011. ^ "Thai Airways International selects A380" (Press release). Airbus. 27 August 2004. Archived from the original on 27 September 2011. Retrieved 8 April 2011. ^ "China Southern Airlines sign for five A380s" (Press release). Airbus. 21 April 2005. Archived from the original on 27 September 2011. Retrieved 4 April 2011. ^ Bhattacharya, Sarbendu (15 June 2005). "Kingfisher becomes first Indian customer for A380, A350, & A330" (Press release). Airbus. Retrieved 14 July 2015. ^ Kingsley-Jones, Max (16 May 2006). "Airbus A380 Freighter delayed as Emirates switches orders to passenger variant". Flightglobal.com. Reed Business Information. Retrieved 4 April 2011. ^ "Singapore Airlines selects Rolls-Royce Trent 900 and TotalCare for additional A380s" (Press release). Rolls-Royce. 15 February 2008. Archived from the original on 2 April 2012. Retrieved 8 April 2011. ^ "Singapore Airlines boosts Airbus fleet with additional A380 orders" (Press release). Airbus. 20 December 2006. Retrieved 7 January 2011. ^ "Qantas Orders Additional A380 Aircraft" (Press release). Qantas. 29 October 2006. Retrieved 11 April 2011. ^ "Rolls-Royce to power additional A380s for Qantas Airways" (Press release). Rolls-Royce. 19 September 2008. Archived from the original on 4 September 2011. Retrieved 8 April 2011. ^ "Qantas signs firm order for eight additional A380s" (Press release). Airbus. 21 December 2006. Retrieved 20 August 2018. ^ "Qantas CEO: no plans to buy more Airbus A380s". Australian Business Traveller. Retrieved 28 March 2018. ^ "FedEx Express to Acquire Boeing 777 Freighters" (Press release). FedEx Express. 27 November 2006. Retrieved 11 April 2011. ^ Schlangenstein, Mary (7 November 2006). "FedEx Drops Airbus A380 Order, to Buy 15 Boeing 777s". Bloomberg L.P. Retrieved 3 April 2011. ^ Wilber, Del (8 November 2006). "Airbus Bust, Boeing Boost". The Washington Post. Retrieved 12 May 2010. ^ Kingsley-Jones, Max (4 December 2006). "ILFC to defer its Airbus A380 order until at least 2013, ditching freighter variants for passenger configuration". Flightglobal.com. Reed Business Information. Retrieved 12 May 2010. ^ "UPS to Cancel A380 Order" (Press release). UPS. 2 March 2007. Retrieved 8 April 2011. ^ Dunn, Graham (24 May 2007). "Air France to replace 747 fleet with 18 777s and two A380s". Flightglobal.com. Reed Business Information. Retrieved 11 April 2011. ^ "Qatar Airways Confirms Orders For 80 Airbus A350s At Paris Air Show" (Press release). Qatar Airways. 18 June 2007. Archived from the original on 23 November 2007. Retrieved 11 April 2011. ^ "Emirates Airline agrees to buy eight additional Airbus A380s" (Press release). Airbus. 18 June 2007. Retrieved 7 January 2011. ^ "Green Light For Aircraft Orders" (Press release). British Airways. 27 September 2007. Retrieved 9 April 2011. ^ "British Airways selects Rolls-Royce power for long haul fleet" (Press release). Rolls-Royce. 27 September 2007. Archived from the original on 2 April 2012. Retrieved 8 April 2011. ^ "HRH Prince Alwaleed bin Talal places first order for A380 flying palace" (Press release). Airbus. 12 November 2007. Retrieved 4 April 2011. ^ "Rolls-Royce Trent 900 to Power first VIP A380" (Press release). Rolls-Royce. 12 November 2007. Archived from the original on 2 April 2012. Retrieved 8 April 2011. ^ "Korean Air to buy 3 more A380 jets from Airbus". Reuters. 13 February 2008. Retrieved 12 May 2010. ^ Kaminski-Morrow, David (17 July 2008). "Farnborough 2008: Etihad switching four test A380s for 10 new-build". Flightglobal.com. Reed Business Information. Retrieved 12 May 2010. ^ "Etihad places 55 firm aircraft orders with Airbus". Etihad Airways. 14 July 2008. Retrieved 12 May 2010. ^ "Air Austral signs firm order for two single class A380s" (Press release). Airbus. 17 November 2009. Archived from the original on 16 February 2011. Retrieved 12 May 2010. ^ "Air Austral selects A380 in single-class configuration for future growth" (Press release). Airbus. 15 January 2009. Retrieved 7 January 2011. ^ Kaminski-Morrow, David (15 January 2009). "Air Austral to take 840-seat A380s in 2014". Flightglobal.com. Reed Business Information. Retrieved 11 April 2011. ^ "Korean Air Adds Two A380 to Fleet Order, Upping A380 Order to Ten" (Press release). Korean Air. 3 February 2009. Retrieved 11 April 2011. ^ "Korean Air orders two more A380s" (Press release). Airbus. 3 February 2009. Retrieved 7 January 2011. ^ "Emirates orders 32 Airbus A380 super jumbos valued at US$ 11.5B". Emirates. 8 June 2010. Retrieved 4 April 2011. ^ "Emirates orders a further 32 Airbus A380s" (Press release). Airbus. 8 June 2010. Retrieved 4 April 2011. ^ "Skymark signs firm contract with Airbus for purchase of A380s" (PDF) (Press release). Skymark Airlines. 18 February 2011. Retrieved 11 April 2011. ^ "Skymark Airlines of Japan confirms order for four A380s" (Press release). Airbus. 18 February 2011. Archived from the original on 21 February 2011. Retrieved 18 February 2011. ^ "Skymark and Airbus reached a basic agreement on Introduction of A380" (PDF) (Press release). Skymark Airlines. 8 November 2010. Retrieved 11 April 2011. ^ "Rolls-Royce wins Trent 900 contract from Asiana Airlines" (Press release). Rolls-Royce. 16 March 2011. Archived from the original on 19 March 2011. Retrieved 4 April 2011. ^ "Asiana Airlines places order for six A380s" (Press release). Airbus. 6 January 2011. Retrieved 7 January 2011. ^ "ILFC orders aircraft from Airbus and Boeing" (Press release). ILFC. 8 March 2011. Archived from the original on 6 October 2011. Retrieved 8 April 2011. ^ "PARIS: Japan's Skymark firms options on two A380s". Flightglobal. 23 June 2011. Retrieved 23 June 2011. ^ "Skymark Airlines orders two more A380s" (Press release). Airbus. 23 June 2011. Retrieved 23 June 2011. ^ "Lufthansa snaps up 2 new Airbus superjumbos" (Press release). Reuters. 29 September 2011. Retrieved 15 November 2011. ^ "Furthering fleet growth with world's most eco-efficient aircraft" (Press release). Airbus. 15 November 2011. Retrieved 15 November 2011. ^ a b "Orders & Deliveries December 2011" (Press release). Archived from the original on 20 December 2012. ^ "Airbus A380 Customers". Airbus Press Office. September 2013. Archived from the original on 14 December 2013. ^ "Rolls-Royce receives record £6bn engine order". BBC News. 17 April 2015. Archived from the original on 17 April 2015. ^ "Deal called off for delivery of Airbus A380 to Japanese airliner". TheJapanNews.net. 29 July 2014. Retrieved 31 July 2014. ^ "Airbus Cancels Only VVIP A380 Order". ainonline. 5 February 2015. ^ "Emirates orders two additional A380 aircraft". Emirates. 13 April 2016. ^ "Air France canceled remaining 2 A380". Website. 10 February 2017. Retrieved 26 May 2017. ^ "Emirates signs agreement for up to 36 additional A380s". Website. 18 January 2018. Retrieved 18 January 2018. ^ "Emirates firms up order for up to 36 additional A380s". Website. 11 February 2018. Retrieved 12 February 2018. ^ "Virgin Atlantic Formally Cancels Their A380 Order". ^ "Emirates signs deal for 40 A330-900s, 30 A350-900s". ^ a b "EASA Type-Certificate Data Sheet (TCDS) A.110 Issue 05.0" (PDF). EASA. 1 December 2009. Archived from the original (PDF) on 22 May 2011. Retrieved 11 April 2011. ^ a b "FAA Type Certificate Data Sheet (TCDS) NO.A58NM Revision 4" (PDF). FAA. 26 January 2009. Retrieved 19 January 2013. ^ "EASA Type-Certificate Data Sheet (TCDS) E.012 Issue 04" (PDF). EASA. 24 May 2007. Archived from the original (PDF) on 6 August 2010. Retrieved 4 November 2007. ^ "FAA Type Certificate Data Sheet (TCDS) E00075EN" (PDF). FAA. 6 June 2007. Retrieved 19 January 2013. ^ "FAA Type Certificate Data Sheet (TCDS) E00072EN Revision 3" (PDF). FAA. 29 September 2010. Retrieved 19 January 2013.